Erected by the Tar Heel Investment Company. Marker series. This marker is included in the Trail of Tears marker series. Location. 35° 4.885′ N, 84° 2.359′ W. Marker is in Murphy, North Carolina, in Cherokee County. Marker is on Fort Butler Street west of Deweese Street. Touch for map. 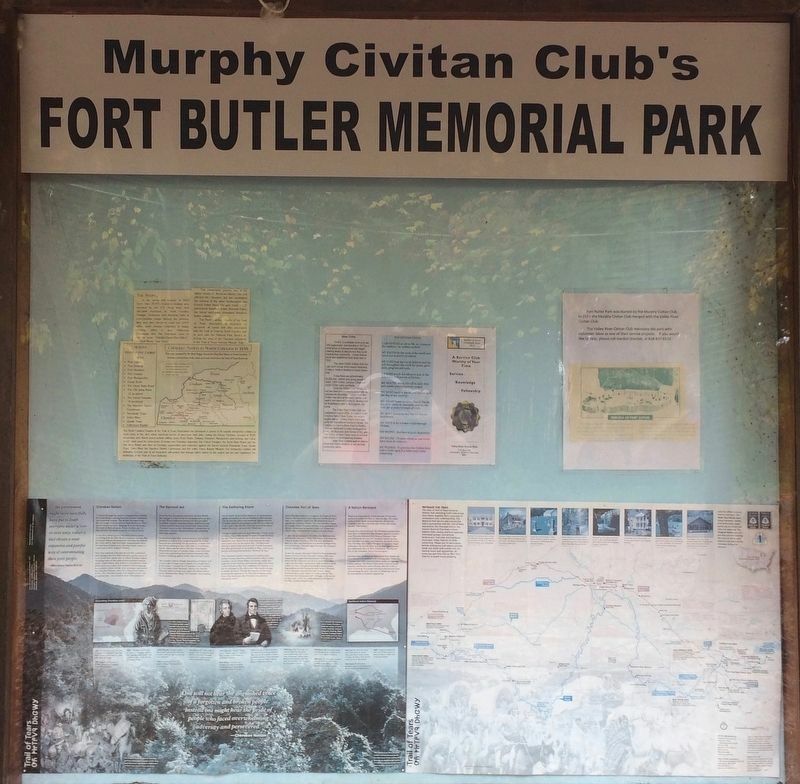 Located in the Murphy Civitan Club's Fort Butler Memorial Park. Marker is at or near this postal address: Fort Butler Street, Murphy NC 28906, United States of America. Touch for directions. Other nearby markers. At least 8 other markers are within walking distance of this marker. Fort Butler (approx. 0.2 miles away); Trail of Tears (approx. 0.3 miles away); Murphy North Carolina Rail (approx. 0.4 miles away); Nuya Saligugi (approx. 2. 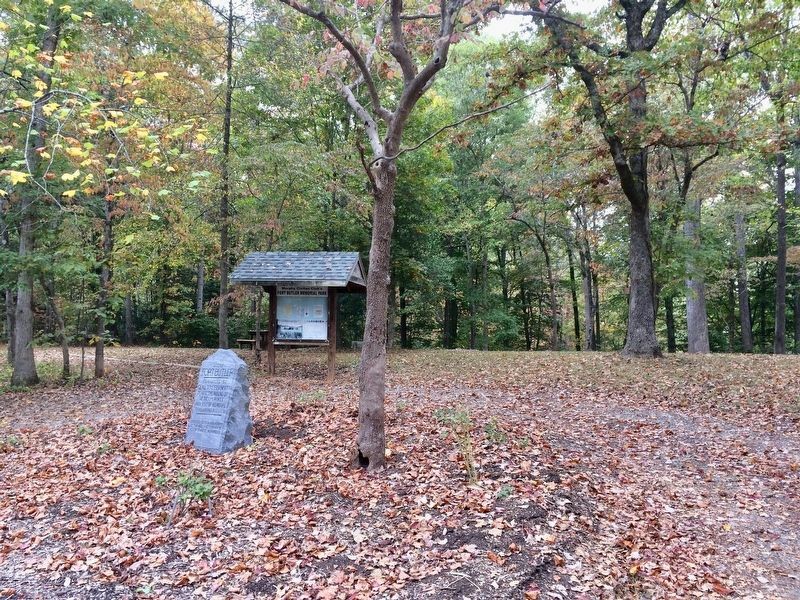 Site of Fort Butler Marker in small memorial park. Located on a small residential street. half a mile away); Water Powered 500 Pound Hammer (approx. half a mile away); Unicoi Turnpike Trail (approx. half a mile away); Prison Cell Door (approx. half a mile away); Cherokee War (approx. half a mile away). Touch for a list and map of all markers in Murphy. 3. Billboard in park, near marker, with info on the Trail of Tears. 4. 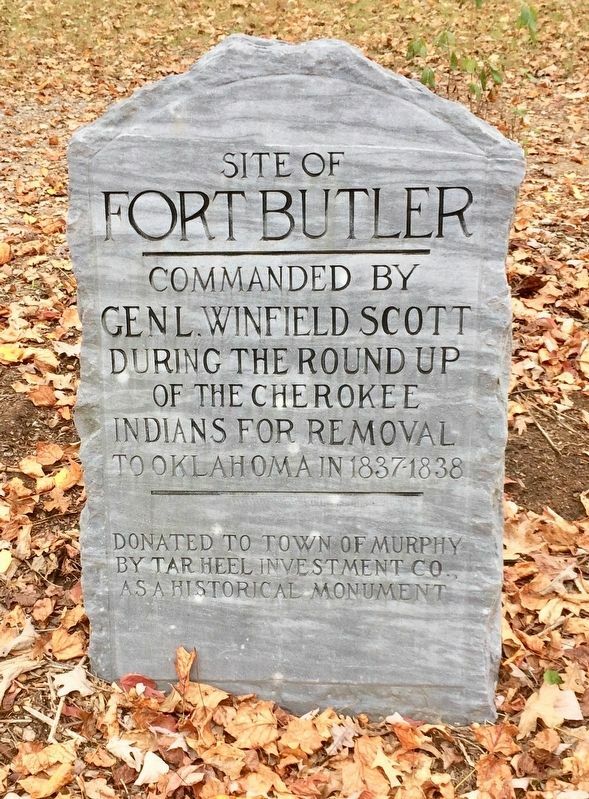 Another nearby Fort Butler Marker located on Hiwassee Street near firehouse. More. 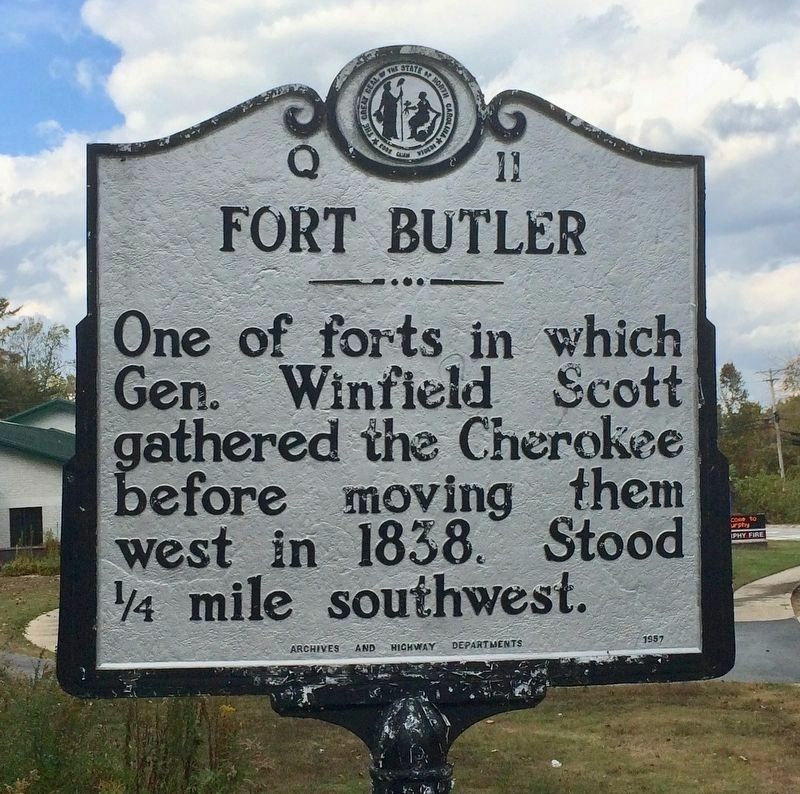 Search the internet for Site of Fort Butler. Credits. This page was last revised on October 21, 2016. This page originally submitted on October 21, 2016, by Mark Hilton of Montgomery, Alabama. This page has been viewed 227 times since then and 7 times this year. Photos: 1, 2, 3, 4. submitted on October 21, 2016, by Mark Hilton of Montgomery, Alabama.